VANCOUVER, Feb. 13, 2019 /CNW/ – IsoEnergy Ltd. (“IsoEnergy” or the “Company“) (TSXV: ISO; OTCQX: ISENF) is pleased to announce chemical assay results from intervals of strong uranium mineralization reported earlier (see news release dated January 28, 2019) from the Hurricane zone. 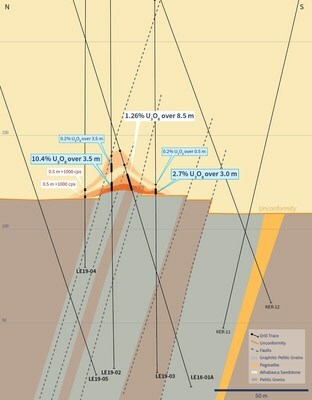 The highlight is an intersection in drill hole LE19-02 of 3.5 metres averaging 10.4% U3O8 from 326.5-330.0 metres, that includes 38.2% U3O8 over 0.5 metres from 329.0-329.5 metres. 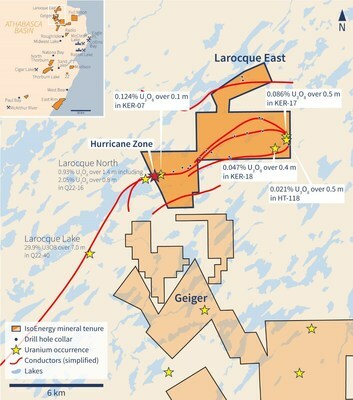 The Hurricane zone is a new discovery of high-grade uranium mineralization on the Company’s 100% owned Larocque East property (the “Property”) in the eastern Athabasca Basin of northern Saskatchewan. The Property covers a 15-kilometre-long northeast extension of the Larocque Lake conductor system; a trend of graphitic metasedimentary basement rocks that is associated with significant uranium mineralization in several occurrences to the southwest of the Larocque East property. The closest of these are the Larocque Lake and Larocque North zones, which are located 6.5 kilometres and 0.4 kilometres, respectively, to the southwest of the western Larocque East property boundary. Drilling at the Larocque Lake zone has returned historical intersections of up to 29.9% U3O8 over 7.0 metres in drill hole Q22-040. Drilling at the Larocque North zone has returned intersections of up to 2.05% U3O8 over 0.6 metres in drill hole Q22-16. Like the nearby Geiger property, Larocque East is located adjacent to the Wollaston-Mudjatik transition zone – a major crustal suture related to most of the major uranium deposits in the eastern Athabasca Basin. Importantly, the sandstone cover is thin, ranging between 140 metres and 330 metres in previous drilling.